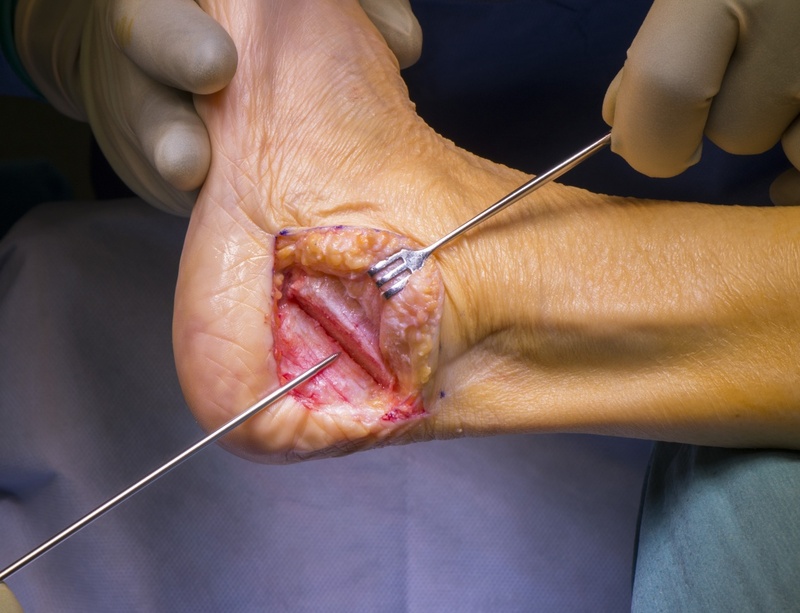 Learn the Pes Planus correction with FDL transfer , Calcaneal osteotomy and Wright Bioarch arthroresis screw surgical technique with step by step instructions on OrthOracle. Our e-learning platform contains high resolution images and a certified CME of the Pes Planus correction with FDL transfer , Calcaneal osteotomy and Wright Bioarch arthroresis screw surgical procedure. Reports of flat foot deformity in association with tibialis posterior pathology appeared in the literature in the 1960’s, in 1989 Johnson and Strom developed a classification for Tibialis Posterior dysfunction, based on the progression of deformity and its treatment. Stability, flexibility and motor control of the hindfoot are very important components of the normally functioning foot. Movement of the hindfoot from eversion to inversion , alters the alignment of the chopart articulation and converts the flexible foot, useful for balance and shock absorption, into a closed pack, rigid configuration, which allows the foot to function as a mechanically effective lever. Normal hindfoot mechanics are reliant upon static (ligamentous), dynamic (musculo-tendinous) restraints, it’s function will also be affected by proximal (e.g valgus knee) and distal (e.g. elevated 1st ray) deformity. There are multiple interlinked static restraints of the hindfoot including the Deltoid ligament, Plantar Fascia, Spring Ligament, Interosseous Ligaments, cervical ligament, the inferior extensor retinaculum. Dynamic stabilisers include the Tibialis Posterior, Tibialis Anterior, the Achilles, Peroneals, Intrinsic foot muscles and to a lesser degree the long to flexors. The Tibialis Posterior tendon is the primary muscle motor, acting to invert the hindfoot converting its function to allow the calf muscles to generate force through the foot more efficiently, and to prevent excessive eversion. Failure of either the ligamentous restraints, the joints or the muscle motors lead to dysfunction of the foot, often in association with pain. The Tibialis Posterior muscle originates from the posterior border of the Tibia, the Interosseous Membrane and the fibula. the tendon forms in the lower third of the leg and passes within a thick retinaculum in a groove over the posterior and inferior margin of the medial malleolus. The tendon develops a major insertion onto the plantar medial aspect of the navicular tuberosity before passing plantarly with insertions into the cuneiforms, the 2-4th metatarsals and the cuboid. The most common cause of adult acquired flat foot is a failure of the Tibialis Posterior tendon, this can fail in the midsubstance or at the insertion, where it develops tendinopathy with midsubstance splits, tears and stretching, which may ultimately result in a complete rupture or more often an elongated, dysfunctional tendon. There is debate as to whether, the ultimate failure of the Tibialis Posterior tendon is the primary pathology, or whether this is the common end point of progressive failure of the static ligamentous constraints, leading to abnormal kinematics of the hindfoot which results to abnormal strain on the Tibialis Posterior tendon. Dyal found that 70% of patients with tibialis posterior insufficiency had a contralateral flat foot, suggesting a pre-existing tendency to over-pronation is a significant risk factor. Age hormonal and genetic factors are also likely to play a role on the condition, Kohls-Gatzoulis 2009 reported this to be more common in the over 40 population with a ratio 3:1 female: male. Various authors have shown median age ranges of between 45 and 60. Institution: The Royal National Orthopaedic Hospital , Stanmore , London ,UK.